Of the six known bottles made for Nayancheng where his name is inscribed on the foot, this is the only one that is decorated. The material fits ideally into his obvious taste for understated nephrite but the carved detail is unique among the five known examples apparently made specifically for him. The nephrite here is stained, in common with so much of what was produced at or for the court during the Qianlong era. The implications of this are fairly obvious. Nayancheng was a high Manchu official familiar with court taste of the late eighteenth century when he began his official career at a time when the Qianlong emperor exerted immense influence over the arts. Whatever the emperor liked would undoubtedly have influenced his close associates and courtiers. This need not necessarily imply that the bottle itself was manufactured at court, but Nayancheng would likely have had access to court workshops and was probably also the recipient of gifts of snuff bottles from the emperor. 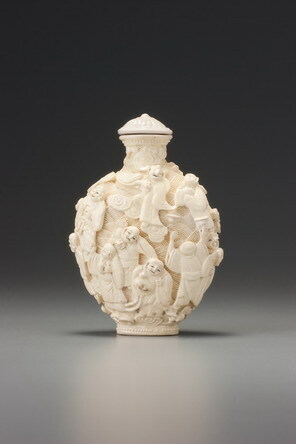 Whether or not this bottle was a gift from the Qianlong emperor from early in Nayancheng’s career, or from the Jiaqing or Daoguang emperors he also served, is stylistically immaterial. The Qianlong emperor’s taste, imposed so effectively particularly on jade carving during his reign, continued to be felt in subsequent reigns. 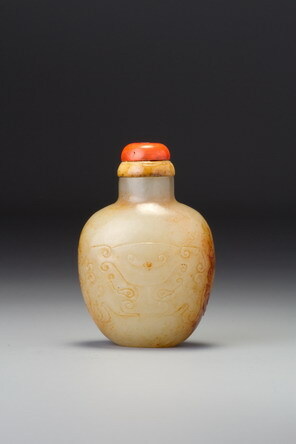 If this was an Imperial gift, then Nayancheng would probably have taken it to the jade workshop he patronized for some of his other bottles and had his name added to the foot in his apparently common practice of identifying personal ownership. The inscription itself suggests this possibility. All marks are, by definition, added after a bottle had been finished, whether by the original artist or another at the command of the owner. Whoever added this mark began confidently with the first character contained within the right-hand side of the available space, but wrote it rather too large to allow for the comfortable inclusion of the second character within the rest of the space, requiring for calligraphic grace that it overlap the footrim on the left-hand side. This crowding of the inscription onto the foot area is common to all his bottles. This example is extremely well hollowed, in common with five of the six known works bearing his name on the foot, the exception being lot 35 in this sale, which is well hollowed but not as painstakingly as the others. It is also a delightful form in the hand, its size, perfect formal integrity, and compressed ovoid shape fitting ideally into the palm.